We knew that returning to Mumbai after travelling in the country would be a very different feeling to our first arrival in the country 3 weeks prior. Our experiences of the last 21 days had given us a taste of India, and whilst even a whole lifetime would not be sufficient to understand this vast and varied sub-continent, we we certainly a lot more streetwise and acclimatised to our environment. We were again fortunate and grateful for the warm and generous hospitality of Sudha, who not only accommodated us but also treated us to some more of her home made local tastes and cuisines. Our penultimate day in India also included another excursion into the city which again reflected the eclectic nature of this metropolis. We began with a visit to the Mahalaxmi Temple which is dedicated to the Hindu Goddess Laxmi, the goddess of wealth. 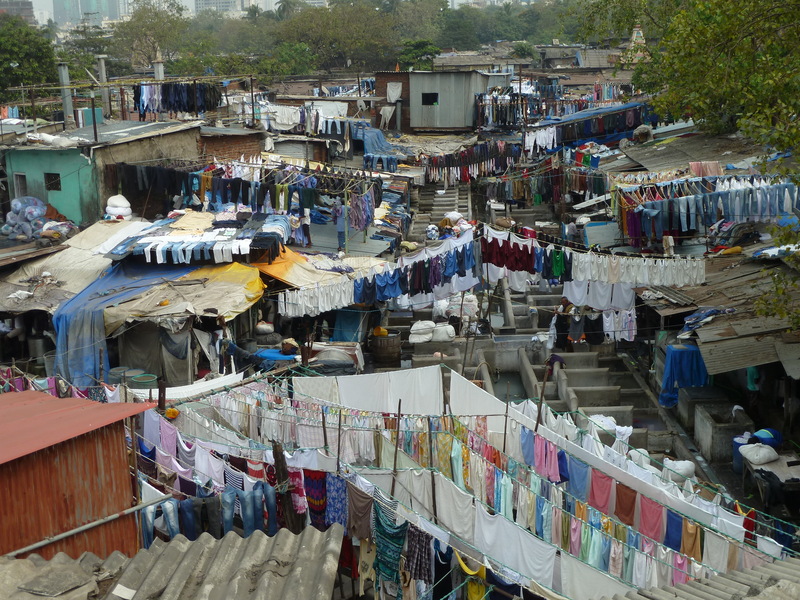 We then stopped off for a view of Mahalaxmi Dhobi Ghat, a 140 year old human powered laundry containing 1026 open-air troughs! Close by was the famous Girguam Chowpatty, more commonly known in English as Chowpatty Beach, which doesn’t really make sense as “Chowpatty” means beach! 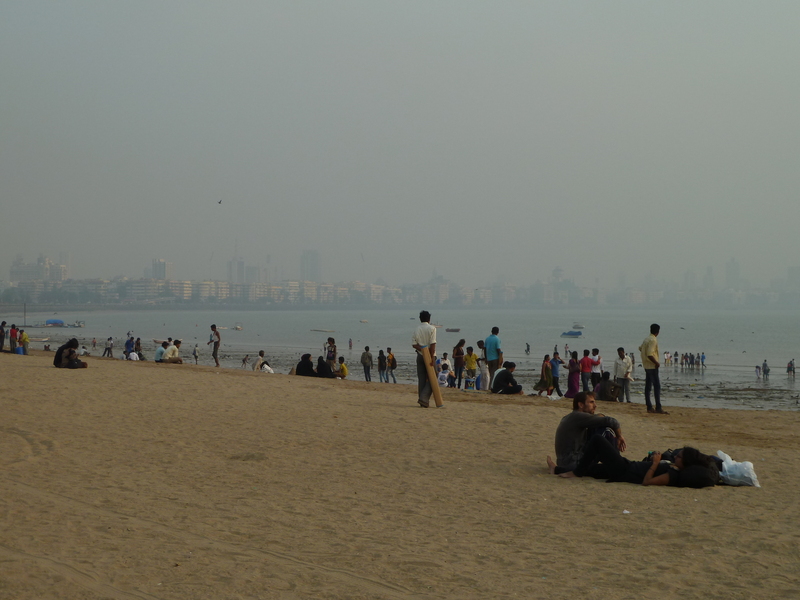 In any case like many beaches, there were tourists, couples, bathers, picnics, people watchers and even some animals, all with a backdrop of the Mumbai skyline and the orange glow of the sun in its haze. We had decided that a visit to India, and especially Mumbai, wouldn’t be complete without going to see a Bollywood movie. Given the movie would be in Hindi with no subtitles, it was all about the “experience” and we took Sudha’s suggestion of seeing “Ram Leela”. It was assured to have all of the key elements of a Bollywood classic, a hero & heroine, some (mild) violence, families feuding, lots of singing, dancing and love songs, all set within picturesque scenery. Given it was an adaptation of Shakespeare’s “Romeo and Juliet”, of course we were able to follow it meticulously…! It was great to be able to recognise some of the scenes set in Udaipur where we had been only days earlier. Nevertheless a great escape into the fantasy world of Mumbai’s equivalent of the West End. 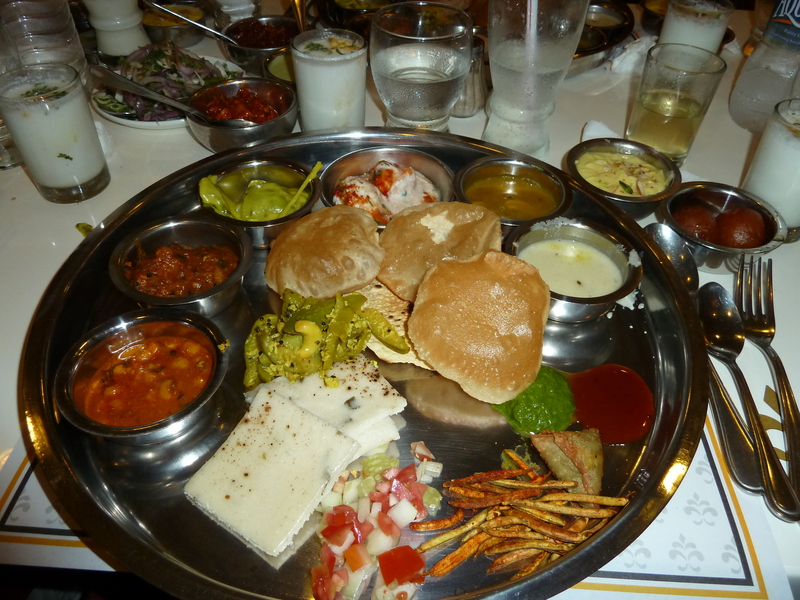 Nothing of course could better top the day off than a final taste of India, this time at the Restaurant “Samaat” famous for its “bottomless” Gujarati Thali’s, of which tastes more than adequately matched our day (& probably even last 3 weeks) of widely stimulating all the senses!